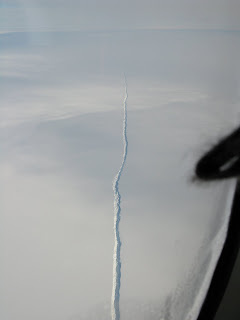 This crack in the iceshelf is about an hour outside of McMurdo, and had to be about 100 feet across or so. The rest of the three hour flight was pretty much flat white. Coming in for the landing at Siple Dome. The Siple Dome jamesway. The doors are on opposite ends of the jamesway, even though that isn't apparent in this photo. Siple Dome is considered by those that live there and those who stop there to be a truck stop. 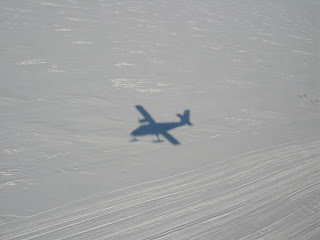 It's between McMurdo, the South Pole, and WAIS, so it allows Twin Otters to refuel to head to the other stations. The three people there have been at Siple Dome since October 31st. 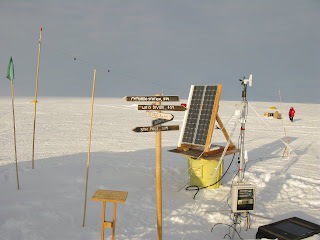 Of the deep field locations, it's probably one of the nicest as it's only at 2000 feet elevation and it doesn't get all the storms that WAIS does. Flights have been delayed getting to WAIS by 2 weeks because of bad weather. One downside to working at Siple is weather observations must be made hourly starting 6 hours prior to a planes departure, and because planes refuel at Siple, they end up doing a lot of weather observations starting at 3 am for cancelled flights to WAIS. Having some fun after recovery. 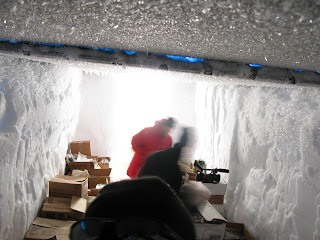 They actually didn't bring much frozen food with them as the camp used to have about 30 people doing research years ago, so they just went through a lot of leftovers. We were quite spoiled as not only did they cook for us, but the food was good too. 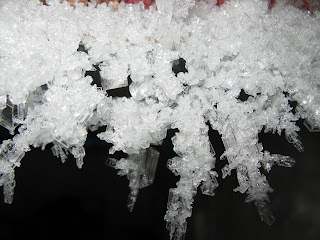 The roof of the freezer was covered in all kinds of ice crystals. These protruded about 3 inches from the roof. That one was a little over half an inch across. 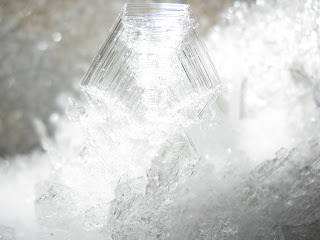 These were about an inch and half long. As with any camping, food and the bathroom become major topics for discussion. This toilet and poo stick. 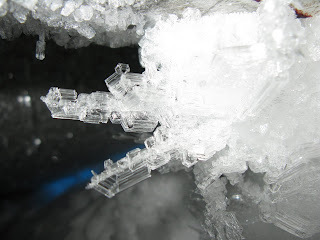 The hole for the toilet is made by using a heater to blow hot air to melt the snow, so every now and then the stalagmite must be knocked over to make use of the entire volume of the hole. 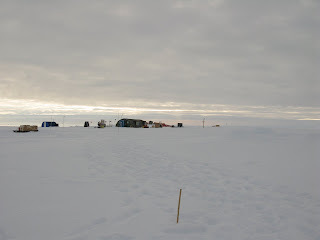 In the background is where the pilots sleep if they spend the night at Siple Dome. 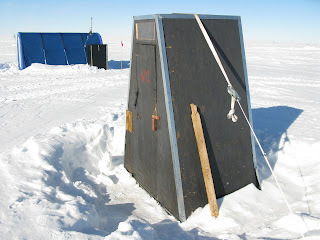 The three station members have their own tents spaced around the camp so that way they can have their own space and get away from everyone else.  What no horizon defintion looks like. When the whole horizon is like that, it makes walking quite difficult as you just appear to be floating and can't make out any bumps or holes in the ground. The clouds didn't completely cover the entire sky, so it wasn't too bad. Aside from that evening, the weather at Siple Dome was pretty nice and the sleeping bags in the tents were too warm. A little bit of color in the sky. I know I notice it more, because as of today, it's been three months since I've seen a sunrise or sunset. The Basler, a modified DC-3, that came to pick us up and offload some fuel. 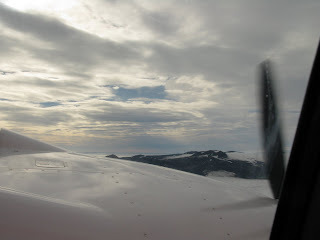 My last flight into McMurdo. Hi, Brian -- It's great to see your pictures from Siple last year. -- good shots of the camp and Glenn, Sal and me. Thanks for posting them. I'm so sorry I didn't see this comment until now. I hope the rest of your season went well and I don't know if you came back last year or this year, but I still believe that Siple Dome had to be one of the nicest places to visit on the continent. 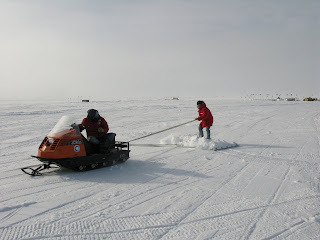 I ran into Glenn last year at the South Pole when he arrived during the traverse. I hope things are going well for you.